Healicoll is a Bio - Engineered high purity Type-I collagen (>97% pure) forming an acellular skin substitute construct that is highly bioactive, cell conductive, and supportive towards enhancing tissue generation for wound management. Healicoll is an acellular dermal replacement product and is within the definition of a bioengineered skin substitute. It provides a framework that promotes the regeneration of blood vessels and supports biologic cell migration due to the resorbable properties of Healicoll. Treatment course typically involves 1 to 4 applications.It is processed under GMP conditions and with stringent USP qulality tests as per WHO other International Standards. Surgical wounds: Donor sites/grafts, Post-Mohs' surgery, Post Laser surgery, Podiatric, Wound dehiscence. Healicoll can be applied immediately after soaking in sterile water or normal saline solution for approximately 5 to 10 minutes (soaking time is not critical for the efficacy of the product). Healicoll does not require any pretreatment or extensive washing to remove preservatives, etc. Healicoll reduces the wound pain significantly compared to other advanced products. It accelerates tissue remodeling without causing irritation and basically reduces post-treatment care requirements. Healicoll is intended to accelerate the healing rate and to reduce scar formation by depositing oriented and organized collagen fibers, and by regulating the amount of collagenase expressed by keratinocytes. Healicoll provides a faster healing process while reducing patient pain and discomfort. Healicoll reduces the need for repeated dressings and hospital stay thereby reducing the overall wound treatment cost by over 40%. Always handle Healicoll using aseptic techniques. Healicoll should not be applied until excessive exudate,bleeding,acute swelling, and infection is controlled. If air pockets appear beneath the applied Healicoll, it can be gently pressed and removed using a sterile methods. In case of localized bulging due to fluid accumulation beneath Healicoll, a small incision can be made to exude fluid. This incision can be patched with additional small piece of Healicoll that adheres over originally applied Healicoll sheet. After application, Use an appropriate, non-adherent, secondary dressing to maintain a moist wound environment. Frequency of secondary dressing change will be dependent upon volume of exudate produced and type of dressing used. do not forcibly remove sections of Healicoll that may adhere to the wound. Alternatively, Healicoll may form a caramel-colored gel, which can be rinsed away with gentle irrigation. 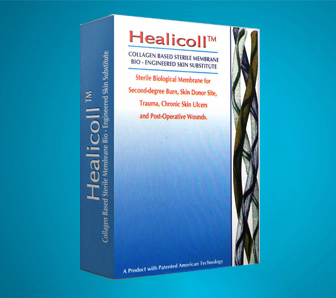 Healicoll is derived from a bovine source and should not be used in patients with known sensitivity to bovine material. This device is not indicated for use in third degree burns. Do not re-sterilize.Healicoll is sterile if the pacage is dry, unopened and undamaged. do not use, If the package seal is broken. The device must be used prior to the expiration date. Discard all open and unused portions of Healicoll. Healicoll Should be stored in a clean,dry location at room temperature. Under normal storage condition. Do not store above 32°C to (90°F). Healicoll has been sterilized with ethylene oxide gas. Healicoll shelf life is 3 years.